$6.251 million on 1683 screens. Usually when a TV or movie series “jumps the shark”, very gimmicky events signal that status. The term originates with the Happy Days episode in which Fonzie performed a stunt that made him leap a shark. Some series go to crap without such obvious elements, but not many. For the Friday the 13th movies, we can identify many gimmicks over the years, but many fans don’t think these reached shark-jumping status until 1989’s Friday the 13th Part VIII: Jason Takes Manhattan. Sure, Part 3 went 3-D, while Part VII added a girl with psychokinetic abilities. Sending Jason to the Big Apple sounds more desperate. The “high concept” of Manhattan becomes evident from its title. After all those years of terrorizing the small community of Crystal Lake, the forces behind the series decided it was time to take Jason’s show on the road. While moving the action to the Big City may sound like shark-jumping, in this case it actually works, as Part VIII presents one of the better Fridays. The end of Part VII left Jason (Kane Hodder) at the bottom of Crystal Lake. An electrical shock brings him back to life, and he quickly slays two young adults on a houseboat. He soon stows away on the Lazarus, a cruise ship that’ll take local high school grads on a trek to Manhattan. Before the ship departs, we meet some of the kids. Rennie (Jensen Daggett) lives with her uncle Charles (Peter Mark Richman) and suffers from some mysterious mental malady that we don’t learn about immediately. We do find out the Charles disapproves of her presence on the cruise, even though he supervises it. Rennie’s not the only one on the boat with parent issues. Sean Robertson’s (Scott Reeves) father (Warren Munson) captains the ship and seems to want his boy to follow in his footsteps. Sean appears disinterested and resents his dad’s interference and pressure. As Jason stalks the boat and the body count rises, we get to know a little more about Rennie and the others. We see that she suffers from a fear of the water and has visions of a drowning young Jason (Timothy Burr Mirkovich). The film follows the adult Jason’s attacks and the inevitable attempts to stop those assaults along with whatever connection Rennie shares. Eventually this winds up in New York. Don’t expect a lot from the premise promised in the title. The first 60 percent of the film takes place on the Lazarus, and even when they get to the Big Apple, the action fails to do much to exploit the story’s potential. Jason obsesses over killing the characters from the cruise and passes up scads of opportunities to off the New Yorkers. During the last 15 minutes or so, we get a taste for what the story could have become, but it never starts to fly or give us a broader perspective. Nonetheless, I must say I’m damned pleased to get a Friday flick set someplace other than the standard lakeside location. It still exists as an excuse to watch Jason slay teenagers in creative ways, but at least it takes them out of the woods. Though the film stretches its concepts to get Jason into a new locale, I don’t care; I’m just excited to see a change of scenery. At least the teens of Manhattan seem more proactive than their forebears. In the other movies, the kids usually remain in denial until the story’s end. Even Tommy in Part VI gets treated like Chicken Little; he tells everyone of Jason’s revival, but they mostly ignore his warnings. A couple of characters behave in that manner here, but most of them take the threat seriously and work actively to stop the psycho. I get the impression that fans don’t much like Manhattan, and it does differ from most of its predecessors. It comes across more like a traditional action-oriented monster movie than a Friday flick, so maybe that’s one problem they find with it. While I kind of like Manhattan, I do see how it doesn’t fit well with the rest of the series. Its Jason is smarter and shrewder than in prior flicks and is not just the usual brainless killing machine. This doesn’t make much sense, but it makes the movie more entertaining, and given the series’ general lack of logic and continuity, I don’t see a reason to criticize it for this change. As usual, the characters remain generally ill-defined and one-dimensional. At least this flick’s heroine seems more satisfying than usual. Rennie brings a more thoughtful and engaging personality to the table, especially when compared to the shrill Tina from Part VII. Jason’s invincibility causes some problems, though. In most of the earlier films, the stories at least pretended that the participants might stop Jason. That concept doesn’t play into the later entries, as it seems patently obvious that nothing can keep him down for the count. This makes the films less satisfying, since we know the ending will be little more than a tease. I wouldn’t call Jason Takes Manhattan a great movie, but it’s the most satisfying Friday since Part V. It takes a slightly different approach that comes across as reasonably satisfying. Maybe I liked it just because it came after two terrible entries. Nonetheless, it’s generally entertaining. Friday the 13th Part VIII: Jason Takes Manhattan appears in an aspect ratio of approximately 1.85:1 on this single-sided, double-layered DVD; the image has been enhanced for 16X9 televisions. Much of Manhattan looked great, but some small nagging problems negatively affected it. The main issue stemmed from a slightly rough quality that affected much of the presentation. I noticed moderately prominent jagged edges and shimmering through the movie. These never became overwhelming, and at least the movie lacked apparent edge enhancement, but the serrated look made the film look a bit unnatural. Otherwise the image was excellent. Sharpness consistently appeared concise and detailed. I noticed no issues with softness in this distinctive presentation. Source flaws remained minor. Some light grain occasionally popped up, along with a smattering of specks, but these were modest. A few more substantial defects cropped up during shots on a lifeboat, as those offered some marks and grit. After a couple of pretty bright Friday flicks, Manhattan took on a much more subdued palette. That occurred due to the setting, since much of the flick took place both at night and during a rainstorm. The hues we did see looked solid, as they appeared rich and dynamic. Blacks were nicely dense and full, while low-light shots seemed pretty clear and well-defined. The edginess was distracting enough to knock my grade down to a “B”, but otherwise this was a strong transfer. Manhattan marked the second Friday to feature an Ultra-Stereo soundtrack. This worked virtually the same as a Dolby Surround mix, and this one seemed pretty good. The soundfield produced the necessary impression. It stayed oriented in the front, where it offered moderately positive stereo music along with effects that spread convincingly to the sides. They offered up a pretty good sense of atmosphere, especially on the ship. That setting allowed the spectrum to kick in with all sorts of useful ambient noises. The surrounds contributed to the feeling of place as well. They usually acted as general support, but they occasionally became more active, such as when the ship dropped anchor. Quality was satisfactory but not as good as with the last couple of flicks. Speech remained natural and distinctive and continued to lack edginess or issues with intelligibility. For the music, low-end presented slightly dull low-end response, but the score and songs usually appeared acceptably distinctive and lively. Effects packed some decent punch at times, but they also showed more distortion than I’d like. Though the roughness wasn’t extreme, it caused some minor distractions. Ultimately, the audio wasn’t terrific, but it came across as pretty positive for a film from 1989. 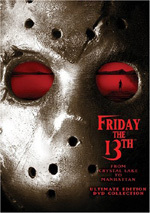 This version of Friday the 13th Part VIII comes as part of a package entitled From Crystal Lake to Manhattan - Ultimate Edition DVD Collection. It gathers the first eight Friday flicks onto four discs and adds a fifth platter of supplements. Four of the flicks include commentaries that I’ll discuss when I get to those movies. Since Paramount designed the set as a connected package, I didn’t give the individual discs grades for supplements; I’ll reserve those for an overall review of the fifth DVD. Half of the eight movies include no supplements, but Part VIII comes with an audio commentary. We hear from director Rob Hedden, who offers a running, screen-specific track. He goes over the cast, locations and challenges connected to the boat, working within genre expectations and trying to confound them, visual effects and stunts. Hedden tosses out a lot of great notes about his original plans for the movie. He tells us he wanted to spend much more time in Manhattan and alludes to elements that would have taken place there. He also discusses snippets trimmed for ratings and some cut for length; the latter would have provided greater character development. At times Hedden tends to simply narrate the story, and a bit of dead air occurs. However, he usually chats about his film in a lively and engaging manner to make this a worthwhile track. 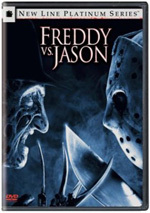 Would I call Friday the 13th Part VIII: Jason Takes Manhattan a good movie? No, but it stands as one of the better flicks in the series, especially compared with the two total duds that preceded it. Moderately clever and inventive, it presents one of the more entertaining Friday films. The DVD offers pretty good picture and sound plus a helpful and illuminating audio commentary. Apparently my positive appraisal puts me in the minority, but I think Manhattan is a fairly enjoyable flick.